Mrs Brown is getting a Saturday night entertainment series! Mrs Brown, of Mrs Brown’s Boys fame, is getting her own Saturday night entertainment programme. That’s right, Agnes Brown will be competing for ratings alongside Ant and Dec’s Saturday Night Takeaway. We just hope it goes better than her attempts to find a suitable Christmas tree. In the new series, Agnes will invite celebrity guests, members of the public and popular musicians to her Dublin home. There will be ‘shenanigans’ and ‘outrageous stunts’ aplenty, for fans of her exploits in Mrs Brown’s Boys. Like the popular sitcom, it will be filmed in front of a live audience and the cast may be forced to break character in fits of laughter. The public will also be invited to take part in a segment dedicated to finding the UK’s most unusual ‘mammies’. A pilot episode for All Round to Mrs Brown’s was filmed in September and is thought to have been a great success. The new series will comprise six hour-long episodes. Executive Producer Dan Baldwin said he hoped All Round to Mrs Brown’s would “take that magical humour from the sitcom and transfer it into a truly outstanding entertainment show for the whole country”. 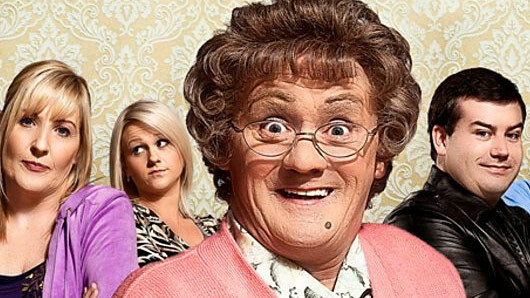 All Round to Mrs Brown’s will air on BBC One later this year.